Before the modern model of career firefighters was formed, firefighting efforts were made up of firefighting volunteers warning their neighbors and fellows of rising flames. This is a tradition continued in the nation’s modern firefighting departments where Volunteer Firefighting Departments remain a critical part of public protection in U.S. cities and communities. According to the U.S. Fire Administration, about 70 percent of the nation’s fire departments are staffed by volunteer firefighters, with many departments retaining a mix of career firefighters and volunteers. 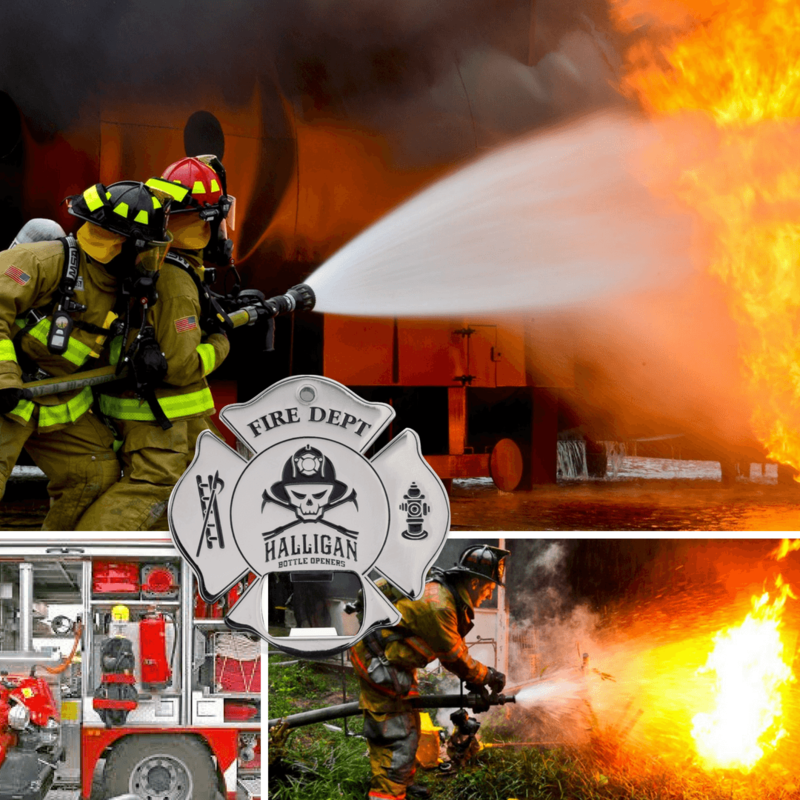 Volunteer firefighters are provided the exact same training and certification as their career counterparts and their volunteer services are often the primary firefighting groups serving smaller communities below 10,000 people. Unlike career firefighters, who might live and work day in and out of their fire station to maintain equipment and answer emergency calls during odd hours of the day. Volunteer firefighters donate their time and work specific shifts, usually they operate within their own chain of command and of course receive much more limited compensation for their time than career firefighters. However, becoming a volunteer firefighter constitutes hundreds of hours of professional training requiring an individual with a strong dedication to their local community. 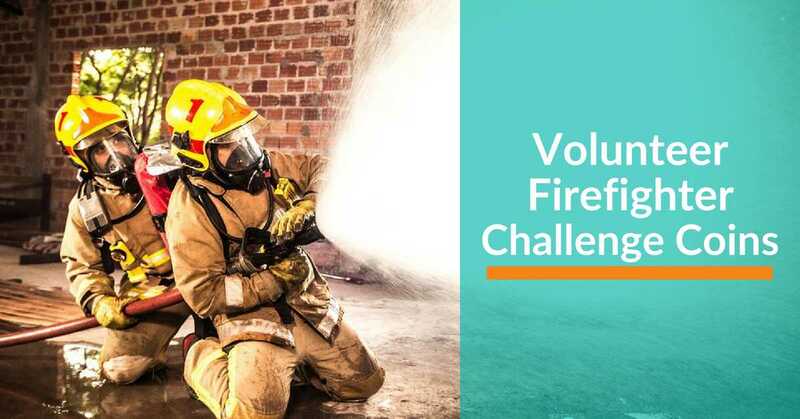 Many volunteer firefighters go on to become career firefighters after serving a few years as volunteers, and many volunteer firefighters were once professional firefighters in retirement who donate their time and expertise. In recognition for that dedication and service, many volunteer firefighters are gifted custom-made challenge coins sharing the design of the larger fire department or commissioned specifically for their group of volunteer firefighters. These challenge coins aren’t merely tokens, but symbols of group camaraderie and the pride of a volunteer fire department. Firefighting in any capacity is an intense profession where trust and teamwork are often important factors to saving lives and protecting the public. Taking a cue from one of the oldest traditions in the military, firefighter challenge coins are used to build group cohesion in a profession that consistently asks volunteers to enter potentially life or death situations. At Signature Coins, we’re experts at crafting custom challenge coins that represent an organization’s role and embolden their owners with pride. Volunteer firefighters make up the bulk of many firefighting organizations throughout the U.S. with their services providing for the safety of their local communities. Fire departments staffed by a combination of both volunteer and professional firefighters are known as Combination Fire Departments. Both professional and volunteer firefighters maintain station-based challenge coins as a means to raise the morale of their teams and bridge bonds between staff members in their departments. Additionally, volunteer firefighters earn their challenge coins performing a variety of duties and responsibilities for their communities. Vehicle extrication - Extracting trapped people from vehicles following a car accident or other incident leaving someone trapped in their vehicles. Fire prevention and education - Educating the public about fire hazards and best practices to avoid the spread of potential fire. Emergency medical services - Many volunteer firefighters in the U.S. are expected to receive the same standardized EMS training of their professional emergency-medical teams. Fire investigation - Following several years as a volunteer firefighter, many go on to become full-time fire investigators who are tasked with investigating the cause of a fire and whether arson is involved. Wildfire response - In regions such as California, where wildfires can be common, experienced crews of volunteer firefighters provide lifesaving services to communities. Hazardous materials handling - Firefighters throughout the country are required to use specialized training and equipment to respond to emergencies involving hazardous materials. Customizing a unique challenge coin for a volunteer firefighter is an exciting opportunity to represent the culture, core values, and atmosphere of a team of volunteer firefighters. When we say “custom design,” we mean it. At Signature Coins, we’ve been working one to one with our clients for over 15 years to provide completely unique challenge coins capturing the unique cultures and lives of our clients. Our dedicated team takes the time and effort to learn about any significant symbols, images, mascots or visual elements that are significant to a client. We then work with each client to figure out how those elements can be best incorporated into a challenge coin design. Volunteer firefighter challenge coins from Signature Coins are custom-designed for every client and usually gifted to an individual firefighter for performing their duties exceptionally well. We offer a number of unique display options to our clients to protect our products and better present them in a larger collection. PVC Pouch - Transparent for easy viewing and acid-free for safe, long-term storage, the classic PVC pouch is offered for FREE with every order. Coin Capsule - Hard, crystal clear and smooth to the touch, the cover and base of the coin capsule snap together firmly to form a perfect seal of protection for your challenge coin. Plastic Stand - An elegant high-quality display stand for military challenge coins, corporate coins or antique coins, the plastic stand is the go-to method for setting your coin on display on a desk or in a display case. Acrylic Case - With a velvet lined interior and hard plastic display cover to keep your coin protected, the acrylic case combines display functionality with refined elegance. Velvet Pouch - For a more personal touch, these black velvet drawstring pouches are easy to use but elegant at the same time. Velvet Case - A black velvet finish covers the outside of the case while inside is a recessed 1 9/16'' circle cutout that will perfectly fit and protect standard challenge coins. 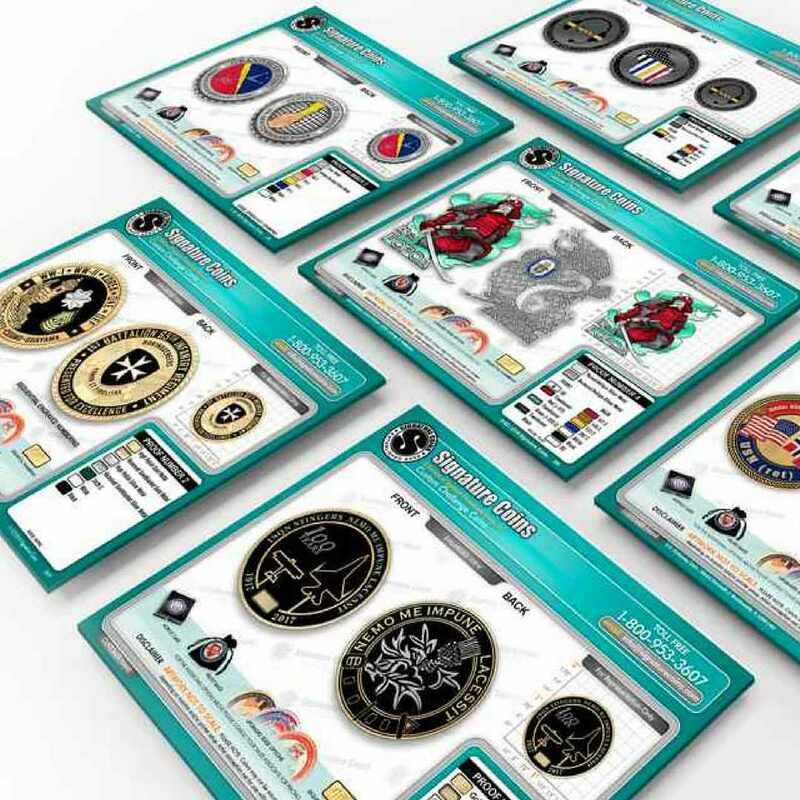 With high-quality craftsmanship, expert customer service, and over 15 years of experience working for clients, Signature Coins is a leading designer and producer of custom challenge coins for any organization. 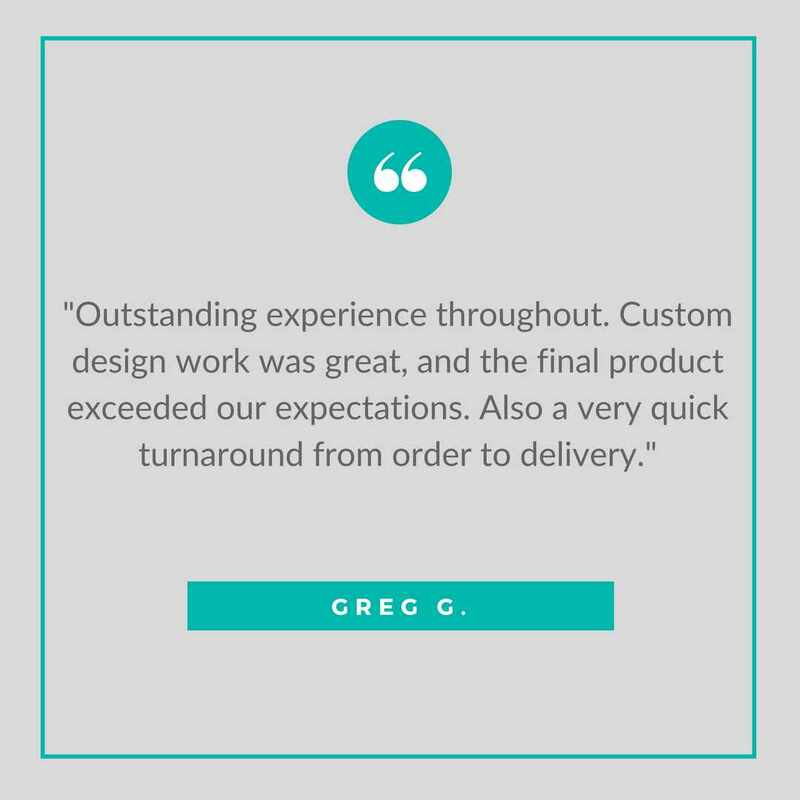 Trust us to work for you and we won’t leave disappointed.